Mount Kilimanjaro is the highest free standing mountain in the world and one of the world’s 7 highest continental summits. It’s no wonder why so many people flock to her – to experience one of the best mountain charity challenges the world has to offer. She stands at an impressive 5,895m above sea level, dominating the African skyline looking down over the African plains. Our charity challenge is to reach Uhuru Peak following the much less trodden Lemosho Glades route. The Lemosho Trail to Uhuru Peak is said to be one of the most stunningly beautiful charity treks in the whole of Africa, and is also considered the best and safest way to summit due to the acclimatisation process on the mountain. Unlike most of the other charity events up Kilimanjaro, the Lemosho Trail consists of 8 full days on the mountain, which will maximise our chances of sufficient acclimatisation in order to conquer the mighty peak. Following in the exact same footsteps of the Comic Releif celebrity trek for charity, we will hike through near enough every eco system known to man – this is an exciting wilderness route we use to avoid overcrowding on the much more trodden Machame and Marangu routes (which are also shorter and therefore, provide less chance to acclimatise sufficiently) – it’s no surprise why the celebs chose this route for their charity challenge! Our Kilimanjaro Lemosho Trail Challenge will definitely leave you with an amazing sense of accomplishment, so don your boots and join us as we hike to the Roof of Africa! Day 1 – We depart the UK on our overnight flight. Day 2 – Meet local guides and transfer to Hotel. Briefing about the challenge. Day 3 – Transfer to Londorossi Gate. Trek to Mti Mkubwa – 2,800m. Day 4 – Trek to Shira Cave 1 – 3,400m. Day 5 – Trek to Shira Hut 2 – 3,900m. Day 6 – Great acclimatisation day. Trek to Laver Tower (4,600m) then trek to Barranco Hut/Camp – 3,900m. Day 7 – Trek Barranco Hut/Camp to Karanga Valley – 4,100m. Day 8 – Trek Karanga Valley to Barafu Hut – 4,600m. Day 9 – Early start and very long day! 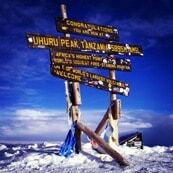 At 12am trek Barafu Hut to Uhuru Peak – 5,895m. Then descend to Millennium Camp. Day 10 – Trek Millennium Camp to Mweka Gate. Celebratory meal in evening in Arusha. Day 11 – Free time, then transfer to airport to flight back to UK. Day 12 – Arrive UK.